coin, bullion, scrap gold and silver, valuables, collectible store – Got collectibles? We Are Interested? Join Us On March 30th, 2019. Bring Along Your Signed Items. We will be closed from December 23rd to January 2nd for inventory taking. We will see you on January 3rd. Merry Christmas and Happy New Year! 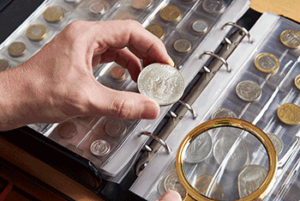 We have been a Florida coin dealer since 1975 and have a large customer following. Herb’s Coin Shop is the place for all your coin and collectible needs. We cater to collectors, dealers, and investors. Bring in individual pieces or large volumes to sell. Competitive pricing is offered for all coins, bullion, and scrap precious metals. Walk-in inquiries are welcome and don’t forget to get a free appraisal on items you bring in. As an Authorized Dealer of Numismatic Guaranty Corporation (NGC) and Professional Coin Grading Service (PCGS) Herb’s will take care of all your grading needs. We offer an honest and friendly atmosphere. Herb’s is more than just a coin shop. The latest in Magic: The Gathering cards are one of many other collectibles offered along with unused stamps, high-end unopened boxes and packs of baseball cards. A changing selection of antiques such as war medals, collectible pins, old post cards and first day covers are also available. We have a variety of supplies to keep your collectibles safe and organized. For online shoppers we offer guaranteed satisfaction at our eBay store.